DES MOINES, Iowa - Each summer Des Moines Performing Arts (DMPA) offers young people throughout the Midwest the opportunity to explore their interest in performing arts. 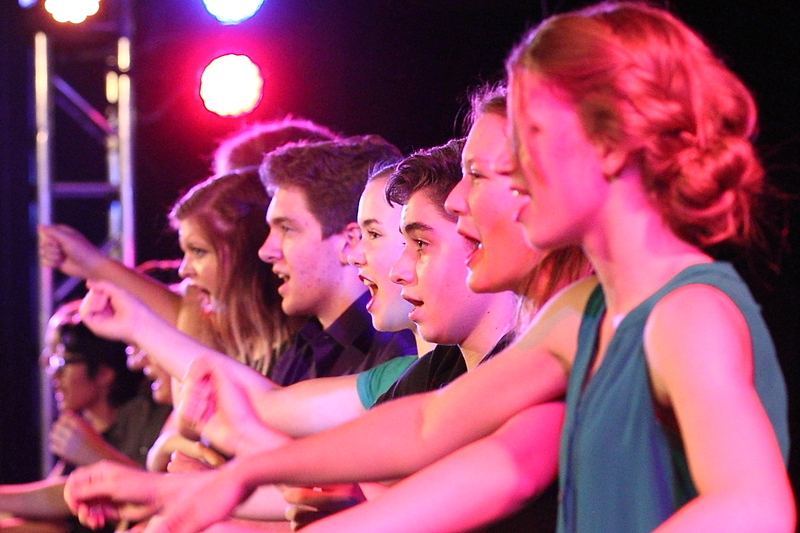 Four camp models will be offered this summer and includes, Musical Theater Camp: Let’s Put On a Show! (six sessions), Mission Improvisation: Featuring The Play That Goes Wrong (one session), Broadway Summer Intensive (one session), and Broadway Academy (one session). Registration begins Wednesday, Jan. 23, 2019 online at www.DMPA.org/education. Questions should be directed to 515-246-2360. MUSICAL THEATER CAMP: LET’S PUT ON A SHOW! Camp Times: Monday through Thursday, 9 a.m. – 4 p.m. and Friday, 9 a.m. – 7 p.m.
Act, sing, and dance as you put on an entire musical in one week! This week-long day camp invites young artists to explore their talents and skills as musical theater actors in an original musical production. Each participant is guaranteed a role – assigned on the first day through an audition process – and will rehearse throughout the week. Additional workshops devoted to developing musical theater skills round out each day. No previous experience necessary; all experience levels are welcome. Camp Times: Monday, Wednesday, Thursday, 9 a.m. – 4 p.m., Tuesday, 9 a.m. – 4 p.m. (day activities) and 7:30 p.m. – 10:00 p.m. (The Play That Goes Wrong), Friday, 9 a.m. – 5:30 p.m.
*Final showcase on Friday at 4:30 p.m. Learn to improvise characters and stories that will make audiences laugh and cry! This week-long day camp explores the problem-solving and quick thinking skills that allow actors to work together to create strong characters and stories. Improvisation teaches courage, accountability, trust, and collaboration, as well as strengthening acting skills. Included in the tuition is one ticket to the Tuesday, June 25, evening performance of The Play That Goes Wrong, the most comedic disaster to ever hit Broadway! All camp participants are encouraged to attend as a lead-in to exclusive interaction with company members of the show. No previous experience necessary; all experience levels are welcome. Camp Times: Monday through Friday, 9 a.m. – 5 p.m. and Saturday, 9 a.m. – 3 p.m.
*Final showcase on Saturday from 2 p.m. – 3 p.m. Guest Broadway performers lead teens in a week-long series of master classes on the “triple threat” skills of musical theater — acting, dancing, and singing. Participants sharpen their performance skills, gain knowledge about the auditioning and casting process, and learn about the Broadway industry from working professionals. The week culminates in a showcase for family and friends. Auditions are not required, although previous theater training or experience is necessary. *Final showcase on Friday at 5:30 p.m.
Open to any middle school student grades 6-8 who dreams of performing in a musical. This week-long day camp brings experienced guest Broadway performers to lead sessions in the triple threat areas of musical theater – acting, dancing, and singing. Throughout the week, participants also receive coaching in audition skills, appropriate song selection, and performing. Faculty will begin with each participant at his or her ability level and lead them through activities designed to stretch skills. No audition is necessary; previous music, dance, or acting experience is recommended. Des Moines Performing Arts is a private not-for-profit organization celebrating 40 seasons of presenting the performing arts to Iowa and the surrounding states on four stages in Des Moines – the Civic Center, the Stoner Theater, the Temple Theater and the newly renovated outdoor space, Cowles Commons. Des Moines Performing Arts is a presenter of major Broadway and educational touring companies, performers and groups, and is home to many local and regional groups, including the Des Moines Symphony. All performances of the Broadway Series are supported by Willis Auto Campus. All performances at the Temple Theater are supported by Prairie Meadows. All performances of the Family Series are supported by Wellmark Blue Cross and Blue Shield. For more information, visit DMPA.org.